The Browns named rookie Baker Mayfield their starting quarterback following a dazzling performance against the Jets in which Mayfield rallied the team to its first victory since Christmas Eve 2016. “It’s an honor. That’s what I wanted to be,” he said. 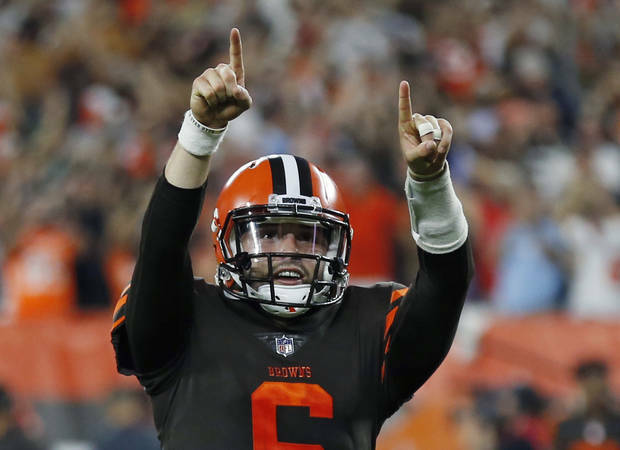 “I’m happy, but it’s just the beginning.” Browns coach Hue Jackson came to the decision after Mayfield passed for 201 yards on 17-of-23 throws and looked every bit the franchise quarterback the Browns hope he’ll grow into someday. Mayfield showed patience and poise in the pocket and was precise with his throws, leading a comeback that sent FirstEnergy Stadium and the city into a frenzy. Jackson and teammates said they could feel the rookie’s energy and confidence radiating around them. It was contagious. “He’s the starting quarterback of this football team. We know that it is a long season, all kinds of things can happen, but Baker Mayfield is the starting quarterback of the team,” Jackson said in a news conference. It was the kind of showing that validated why the Browns tabbed Mayfield with the first-overall pick in the NFL Draft, choosing the former Oklahoma star and Heisman Trophy winner over a handful of other talented signal callers. They saw something special in Mayfield, who finished as one of college football’s most prolific players. Mayfield is set to make his first-career start this weekend against the Raiders in Oakland. He’ll be the team’s 30th starting quarterback since 1999. The Browns hope he’s the last in that long line for some time.